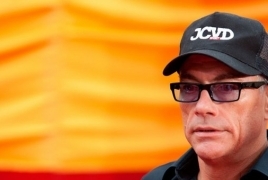 PanARMENIAN.Net - Belgian actor, martial artist and filmmaker Jean-Claude Van Damme will arrive in Armenia to participate in the Comedy Club Festival, set to be held in Yerevan on September 15-16. “I love Armenia so much, and Charles Aznavour is a good friend of mine and my favorite singer from childhood,” the actor was quoted as saying. “Van Damme is a legendary man who looks 55 at the age of 57,” Marina Kravets from Comedy Club joked.